If you want to upgrade the looks and performance of your car or truck you should absolutely be considering the advantages that a good set of fender flares can give you. For as long as there have been cars and trucks on the road there have been enthusiasts who want to improve the ability and looks of their rides. The humble fender flare has been there time and again to help them in their pursuit of perfection. What Are Fender Flares Made From? The right fender flare kit properly installed can have you falling in love with your vehicle even more thanks to improved capability and even better looks. There are a few different scenarios and reasons for installing a set of fender flares on your ride. Increasing the amount of suspension travel in off-road vehicles and allowing you to mount wider wheels and tires for better grip. Covering those wider tires and making sure they don’t throw rocks and debris from the road down the side of your vehicle. Hide unsightly rust and body damage around your vehicle’s fenders. 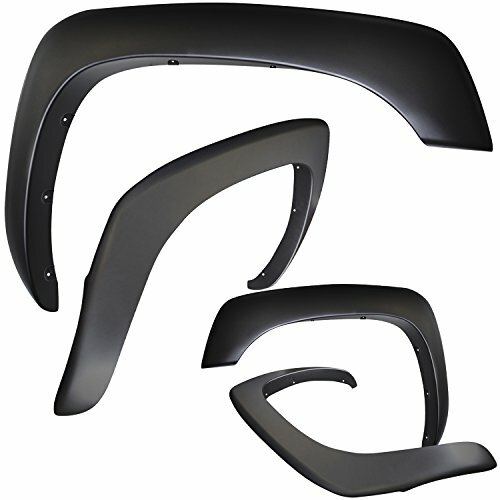 Fender flares simply look cool and add presence to your car, truck, or Jeep on the road! As with the material that your fender flares are made from, a number of different styles exist based on what you’ll be using your vehicle for and the look that you want to go with. Below you’ll find a list of the most common styles of fender flare along with their characteristics, benefits, and drawbacks. Pocket style fender flares don’t even try to look like they came from the vehicle’s manufacturer. 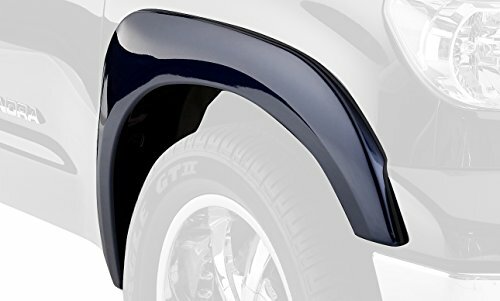 This style of fender flare looks means with exposed rivets set into to top of the flare that follows the contour of your vehicle’s wheel arch. In fact, most pocket-style flares aren’t attached with these rivets at all; they’re included purely to look cool and look cool they do! Pocket style flares are usually mounted in the same way as other varieties of fender flares: with strong adhesive tape and sheet metal screws hidden out of view. Pocket style flares are a great option for complimenting that new set of big chunky tires. If you’re committed to big wheels, big tires, and big suspension travel then cut-out style fender flares might just be for you. Not for the casual customizer, cut-out flares demand that you cut sheet metal out of the OEM fender to increase the size of tire you can run and the amount of suspension travel that your vehicle can achieve. The cut-out flare then tidies this newly enlarged wheel arch up while providing coverage for wider tires at the same time. If you intend to go off-road racing or 4×4 adventuring with a serious truck or Jeep, then cut-out fender flares may be the style for you. Pre-runners and rock-crawlers, your fender flares have arrived! Street style flares are more of an aesthetic upgrade than a performance-oriented one. These flares are traditionally much more subtle than others featured on this list and attempt to blend in with the rest of the vehicle’s lines instead of being aggressively wide like pocket style flares. Although they can widen your vehicle’s bodywork slightly, they more frequently take the form of colored wheel arch surrounds and won’t do much more than the stock fenders to prevent stones and dirt being thrown up by the tires. These flares are ideal for a driver looking to make a subtle customization to their car or truck. OEM style fender flares take the street style flare’s mantra one step further, attempting to look as if they came as standard equipment on the car or truck. OEM style flares will most likely be painted to match the rest of the vehicle and will ideally blend perfectly with the rest of the bodywork’s lines. The OEM look is a very subtle way to customize your vehicle and protect its paint from rock chips and mud. So we’ve seen the street and OEM styles trying to blend in and look like they’ve always been on the side of that truck. Now for something completely different. Extra wide fender flares are extra mean and extra polite society-offending. Maybe you want to install truly massive wheels, and tires on your truck or maybe you’re building a tire-smoking monster of street and track. If you are, you might just want to go extra wide with your flares. The sky’s the limit with this style of flare, with the only restriction being how wide you want your vehicle to be. Fender trim doesn’t add any width to your vehicle’s fenders but looks good and hides any unsightly rust that may be developing around your vehicle’s wheel arches. Instead of spending time and money on bondo, sanding, and painting sheet metal fender trim gives you the ability to stop the rust with a sealant and then cover it quickly and easily for a finish that looks better than the day your truck rolled off the assembly line! Fender trim can be ordered to match the rest of the trim on your vehicle making for a simple and attractive way to hide any imperfections around your wheel arches. So you want to add some fender flares to your vehicle. No matter what you drive there’s a perfect set of functional and good-looking fender flares out there for you. 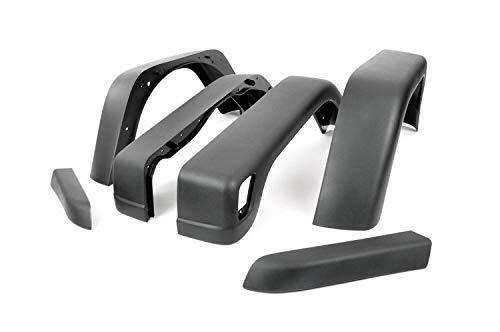 Below you’ll find a list of some of the best fender flares available today that are perfectly suited for a wide range of trucks and applications. Tyger’s flares for Dodge’s full-size truck facilitate a fairly wide range of trim and engine levels when compared to other fender flares on this list. Whether that’s down to ingenuity on Tyger’s part or a lot of shared body panels across the Ram range is something we’ll leave to you to decide! Regardless, Tyger’s offering to the Hemi and Cummins crowd provides a mean-looking pocket-style flare to more people than just about any other product on this list. These particular flares fall neatly into the pocket-style category and come equipped with marine-grade stainless steel rivets to ensure you won’t end up with ugly rust leaking down the side of your truck. Combined with their 100% UV protected matte black finish these bad boys make a very compelling case for themselves and look great while doing it. Tyger’s Ram flares come backed up by a limited lifetime warranty that covers you against cracking, warping, or any other kind of factory defect. You’re gonna have to try really hard if you want to put a dent in these flares! As with many of the other flares on this list, Tyger’s offering doesn’t require any holes drilled into your sheet metal and can be installed in around two hours. Of course, with better quality comes a higher price. Better materials and warranty coverage don’t come cheap, but these flares can be found for some very reasonable prices when you take into account the level of the product that you’re getting for your money. Hard-core appearance exhibited by recessed stainless steel rivets with their enormous presence, Tyger upmarket trim level with Pocket Style Fender Flares never let you down. Flare Height: 5.5" in front and 4.5" in rear. Tire Coverage: 2.5" in front and rear. 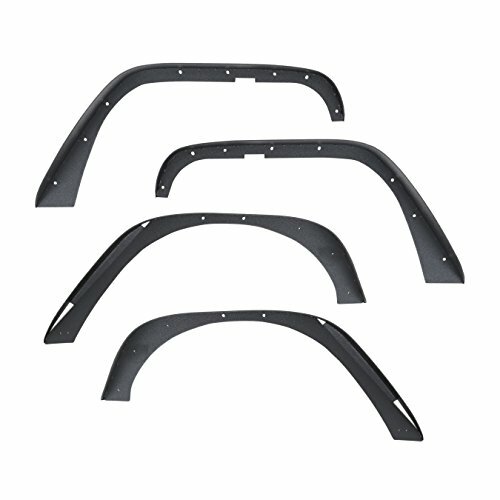 Ensures durability and flexibility through Injection Molding process, enhanced strength of fender flare can strongly against cracking, warping and chalking, offering advanced off-road driving experience. 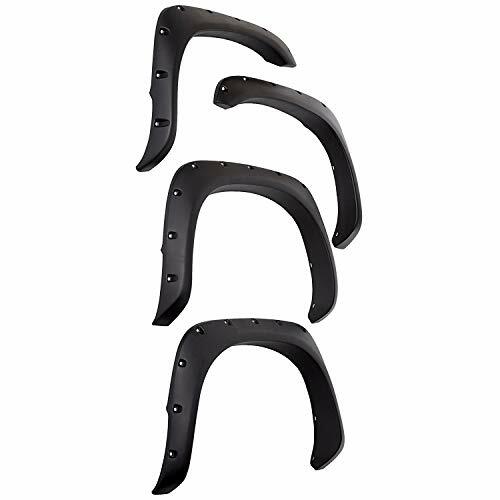 4 pieces 100% UV-resistant fender flares with fine-textured matte black surface finish. Average install time 2+ hours with no drilling required. Mounting Instruction and Hardware included on package. TYGER Limited Lifetime Warranty against cracking, warping or any other factory defects. Smittybilt is a fun company. It’s hard not to be when you make products for a vehicle that’s as endlessly customizable as the Jeep Wrangler. From winches to roll cages to light bars to air compressors, if it’s an off-road accessory then Smittybilt likely makes it. In business since 1956, Smittybilt now offers over 2000 off-road products and accessories from its headquarters in Compton, California. Bucking the trend of every flare set on this list so far, Smittybilt’s XRCs are made from black powder coated steel instead of the ubiquitous ABS (or Tri-Blend in Stampede’s case) plastic. Paving the way for bigger wheels, tires, and suspension travel, the XRCs remove the OE fender and open up a much larger space to play with. Going against the grain once again they ship with a set of self-tapping screws meaning that you’ll be left with some small holes should you decide to remove the flares. Smittybilt’s XRC Wrangler flares work with CJ, YJ, and TJ generation Jeeps and provide around 4” of extra coverage near the headlights with roughly 5” as you move towards the back of the wheel arch. As with the other flares on the list, Smittybilt tells us that the XRCs are easy to paint should the feeling take you. If you’re looking for a stripped-back, wide open look then the XRCs may be the flares for you and your Jeep. OxGord makes a nice, competent flare for a wide variety of GM trucks and SUVs. Whether you’re looking to improve your baby’s stance or cover up unsightly rust on that old beater, these flares may be the ones for you. The four-pack of flares come in matte black that you can leave as-is or easily paint over to match the rest of your vehicle’s paint scheme. If you’re looking for something in an OEM style flare it’s a good idea to consider this offering from OxGord. They’ll add width and street presence to your truck without being too obvious thanks to their easy installation that doesn’t require any drilling into sheet metal; perfect if you’ve protected your pride and joy over the years or if its sheet metal is made from 70% rust as well. OxGord says that these flares are built to be durable and last a long time, and to that end, they offer a limited lifetime warranty to back up their product. OxGord doesn’t have the name recognition in the industry that, say, Bushwacker does. Sure, they make competent products, but in addition to fender flares and a few other auto accessories, they make pet toys and garden tools meaning they aren’t the most prestigious aftermarket manufacturer on this list. Their flares come in at a reasonable price point, but if you’re looking to show off with your fancy brand name paint protectors or you want the very best for your ride, then you’d be better looking elsewhere on this list. Matte black finish. Paint to match body color or leave as-is. CHECK FIRST: Refer to Amazon's Parts Finder Tool to ensure fitment - Select your vehicle's year, make, and model to make sure it fits. 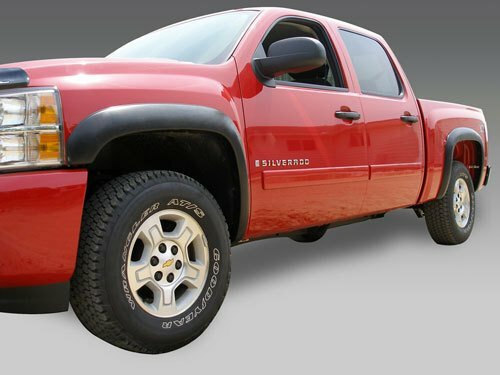 OE STYLE: Easy to install with no drilling required - Built to last - Fender flares for Chevy Silverado, Avalanche, Suburban, Sierra, and Yukon years 1999-2006. STYLISH: Matte black smooth finish which is easily re-paintable to match your finishes look. 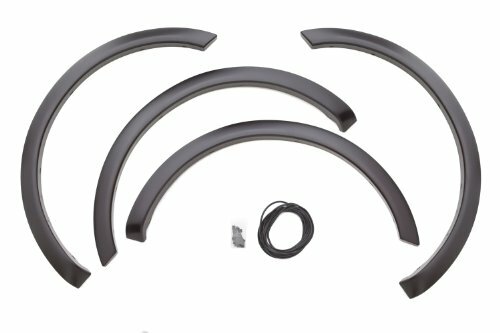 4 PIECE SET: Includes four (4) fender flares with an installation kit and all necessary hardware. Tyger’s flares for Chevy’s Silverado 1500 workhorse are more specialized than others on this list, and that’s because they’re high-quality bits of equipment. Tyger Auto, unlike OxGord, only makes automotive accessories and does so to a high standard. When you manufacture heavy-duty items like running boards, metal bumpers, and tonneau covers, anything you make out of plastic is bound to come up to an excellent standard of quality as well. Tyger’s offering for the Silverado 1500 is manufactured from 100% UV stable plastic and are designed to fit with the 2007-2013 body style. The only drawback is that they’re designed to fit with the contours of the 69.3” short bed version and that version alone. You may be able to find a solution with these flares and a longer bed Silverado, but you do so at your own risk. As with the rest of the flares on this list, Tyger’s Silverado offering can be painted to match body color. 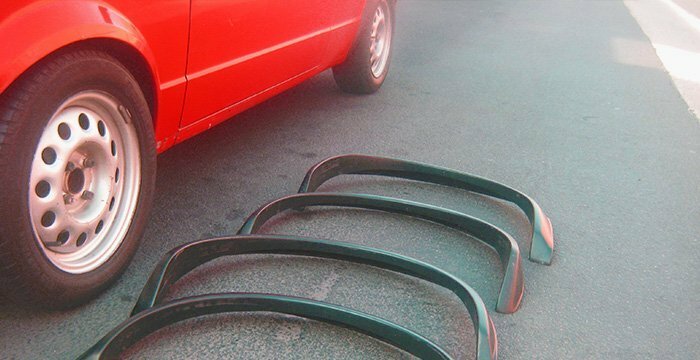 The average price for this particular set of fender flares is surprisingly low, despite marine-grade steel rivets and backing from a limited lifetime warranty covering any warps, cracks, or factory defects. They provide an extra 2” of width to cover wide tires and do their best to protect the paint down the side of your truck with mean-looking style. Carrying on a common theme, Tyger’s TG-FF8C4108 flares are installed fairly easily with no drilling and are attached with factory screws and clips. Backed by Tyger’s lifetime limited warranty against cracks, warping, and factory defects. Flare Height: 6.75" in front and 7" in rear. Tire Coverage: 2" in front and rear. 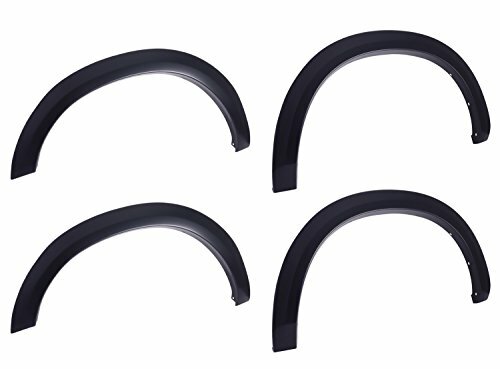 4pc set with front and rear for driver and passenger sides; 100% UV protected smooth matte black finish and paintable to match your specific vehicle color. TYGER Limited Lifetime against cracking, warping or any other factory defects. As with Tyger, Lund is a specialty company that only manufactures quality automotive aftermarket products. Unlike Tyger’s offering, however, Lund’s SX310S Elite Series flares go for a much more subtle OEM style look and upgrade trucks from the Blue Oval. Specifically, these flares are designed to upgrade ‘04 through ‘08 F150s as well as ‘06 through ‘08 Lincoln Mark LTs (incase you want to angry up the look of your luxo-truck). Manufactured from high-quality and 100% UV stable ABS plastic, these subtle flares may be just what you’re looking for in an upgrade that looks like it came straight from the factory. 1.5 inches of extra tire coverage means you won’t be seeing much in the way of width gains, but if you’re in the market to cover wide new rubber, then you aren’t shopping for OEM style flares anyway. Installation is done with clips that attach in factory attachment locations so you won’t need to spend all day drilling and the flares can be had in matte black with a smooth or textured finish. Another similarity that the Elite Series flares share with Tyger’s offering is that quality costs money. In this case, it’s a surprisingly large amount for flares that look like they rolled off the assembly line in Dearborn. Yes, they’re made of very high-quality ABS plastic, but for some, the price of these flares will be simply too high. Front Flare Height: 3"; Front Flare Coverage: 1.5"; Rear Flare Height: 3"; Rear Flare Coverage: 1.5"
The next set of flares on our list comes from a company that rightfully calls itself a global enterprise. Founded in 1973 and headquartered in Brisbane, Australia, EGR operates facilities in North America, Australia, China, Thailand, and Europe. The company’s automotive division supplies external auto accessories to some of the world’s largest car companies manufacturing items like bull bars and tonneau covers as well as acrylic window deflectors and fender flares. The sexily-named 782654WB OEM style flare set comes equipped with EGR’s no-drill fixing system to make sure you won’t have to do any permanent damage to your pride and joy in the quest for paint protection and increased street presence. 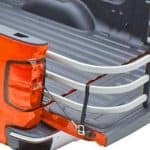 As with the other quality fender sets on this list, the WBs are made from highly durable and UV stable ABS plastic for a long service life on the sides of your Ram 1500. EGR’s offering comes in easy-to-paint matte black and features a lifetime warranty. EGR’s fender flares will almost certainly be manufactured to a high standard of quality. After all, you don’t become a worldwide company by producing shoddy merchandise. Sitting at the mid-to-high point of the price curve you’re guaranteed a quality set of flares, so it’s up to you whether you want to go with the peace of mind that buying from a global corporation comes with or support American manufacturing with a product like Stampede’s Original Riders. If you’ve so much as dipped a toe into the waters of the off-road and 4×4 aftermarket, then you’ll know the name Rough Country. The company, which makes or sells just about everything and anything that you might want to bolt onto your truck, got its start in 1986 and is based in Dyersburg, Tennessee. From humble beginnings, Rough Country has become one of the premier aftermarket forces in trucks and 4x4s. Designed to work with ‘97-’06 TJ Wranglers and also the rare ‘04-’06 LJ and its two-door long wheelbase configuration, Rough Country’s 1031 fender flares provide 3.25” of extra tire coverage while retaining something of an OEM look. There are no flashy pocket rivets here, just the par-for-the-course UV-treated thermoplastic which is resistant to fading and can be painted if you so desire. Expect to spend between 1-2 hours installing the 1031s, which are attached using the factory fender mounting bolts meaning there’s no need to put holes in sheet metal. For a company as established as Rough Country, this particular set of flares won’t break the bank, falling somewhere around the lower middle price bracket out of all the fender flares we’ve mentioned here. As nobody’s company becomes big and successful by selling crappy merchandise, you know you’ll receive a quality product from Rough Country. If you’ve got wider-than-stock tires on your Jeep and you want to cover them without shouting “Look at me!” then these may just be the perfect flares for you. Made of UV Treated Thermoplastic. Offers the same appearance as stock flares. Tire Coverage: 3.25" + Flare Height: 6.5"
Bushwacker got its start in Portland, Oregon in 1967 and has remained an American-owned company ever since. Along with Stampede and a few other parts manufacturers under the Lund umbrella, Bushwacker’s modern headquarters are found in Buford, Georgia. From its early days, Bushwacker has enjoyed a reputation in the aftermarket community for quality and innovation which continues to this day. The 30918-02 pocket style flares are designed to beef up the lines of any 2014-2016 Toyota Tundra and ship with everything you need to install them in your driveway over the weekend. The flare set is produced from Dura-Flex 2000, a proprietary Bushwacker plastic formulation which the company promises is warp-resistant and flexible enough to stand up to even the most formidable of off-road trails. They ship in the customary matte black and can be painted just about as easily as any of the quality flares on this list. Like Stampede’s products, Bushwacker gear is manufactured in the USA and comes with a limited lifetime warranty. That being said, quality materials and bragging rights over name brands don’t come cheap. These particular flares are generally among the most expensive on our list but at least you know you’re getting a quality product for your hard earned dollars. Bushwacker’s Extend-A-Fender is like the calm, subtle version of the pocket style flares that we just showed you. Made to fit the same generation Tundra, these matte black OEM style flares add 1.5” of tire-covering width to your truck’s bodywork. Bushwacker states that these flares will clip into place in “just a matter of minutes” which makes them the easiest install on this whole list. The Extend-A-Fenders are made from the same UV-stable DuraFlex 2000 plastic as Bushwacker’s other fender flare products and come with the standard limited lifetime warranty. The flares can, of course, be painted to suit your taste or left black. Perfect for work trucks and other low-key applications, these durable flares may be just what you’re looking for. Stampede’s products are created at their central facility in Buford, Georgia utilizing the latest in design and manufacturing technology (shared by Bushwacker and a host of other Lund sub-brands). What started as a small operation in Iowa has grown to include an extensive range of aftermarket products for trucks and the wider automotive world such as tonneau covers and hood protectors. Stampede is a dedicated aftermarket manufacturer and doesn’t dilute their brand with pet toys and gardening tools like a certain other company on this list. 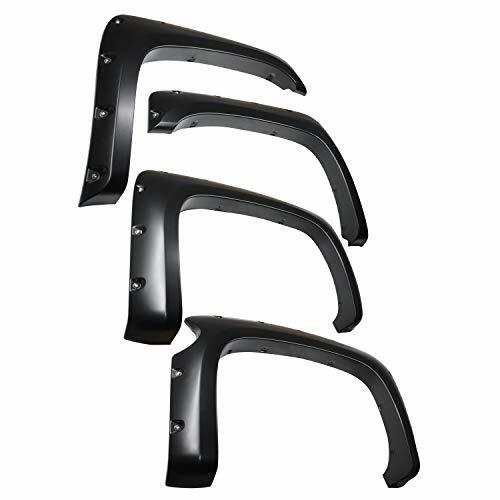 Their products are built well and should certainly be considered when you’re looking for fender flares for your truck. Stampede offers fender flares in three styles ranging from subtle OEM style up to the more aggressive pocket style. Known as the “Original Riderz”, these ones slot in at the more conservative end of the spectrum and beef up your Ram’s style without shouting about it. Manufactured from Stampede’s proprietary Tri-Blend material, the Original Riderz are 100% UV stable guaranteeing that they won’t fade under the harsh sun. All of the flares that Stampede offers can be ordered in black or camouflage finishes. The Original Riders land somewhere in the middle of the price curve for fender flares. They certainly aren’t cheap and nasty like some flares on the market but they also lack the name-brand appeal of the more established aftermarket parts companies like Bushwacker. For this reason, Stampede’s Original Riders OE style flares are something of a hidden bargain. If you want a quality fender flare and don’t need to brag about having bought the very best then these may just be the flares for you. Fender flares can be made from a variety of materials. Some are cheap and don’t last very long, while some are more expensive and will perform to your expectations for years to come. As with most aftermarket parts, spending a little more money up front will save you a healthy chunk of change down the road in repairs or replacing cheap and broken flares. Cheap plastic fender flares will discolor due to the sun’s UV rays and can become brittle and crack during winter’s freezing temperatures. With a quality set of ABS plastic fender flares running as little as around $85 buying these cheap and nasty flares makes no sense at all! Fiberglass flares are the darling of the home builder and grassroots motorsport fanatics everywhere. Fiberglass is inherently stronger than many metals by weight and can be molded into complex custom shapes. The material is also cheaper and more flexible than the expensive carbon fiber used by the big boys. Flares made from fiberglass can be custom-molded to the vehicle or can be purchased pre-made to fit a certain year, model, and brand of vehicle. Fiberglass flares should be coated with sealer and painted to protect them from the sun’s UV rays. Fender flares made from ABS can be bolted on and left totally unpainted as the material is UV stable. ABS flares often come colored black but can also be supplied in a range of other colors. If you’re buying plastic fender flares then you should seriously consider ones made from ABS. Metal fender flares (when done right) can also be extremely durable and make painting simple because they’re made of a very similar material to the rest of your vehicle. They can also be combined with bondo to create a flush finish as if the flared wheel arches have always been part of the car’s body for tuner and JDM style cars or even race cars. Metal flares are usually less aggressive than ABS ones for the simple fact that metal weighs more than high-quality plastic and can prove less rigid the further out from the vehicle they get. 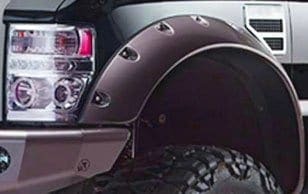 One of the simplest types of fender flares is made from rubber and come to the rescue for those more obscure vehicles that don’t have a lot of aftermarket fender flare options to choose from. The flares are easily attached to the vehicle’s bodywork with sheet metal screws, and their rubbery nature means that you won’t need to worry about them shattering as the result of an impact. Rubber flares are best suited to an off-road vehicle that sees plenty of abuse as they aren’t the prettiest or most durable flares out there. They are, however, resilient to impact and cheap to replace should you get acquainted with a big rock or a tree out on the trails. The choice of material used to construct your fender flares really comes down to personal preference. We would only caution you to avoid the cheap, brittle plastic flares for the reasons mentioned above. Otherwise, the choice of material is all up to personal preference and the vehicle’s intended use! As with any other purchase, before you buy your fender flares, you need to decide exactly what you want them to do for you and your ride. Do you want them to be subtle or shouty? Are they going to cover massive off-road tires or simply protect your paintwork on the highways and backroads? Do you want them to look like they came off the production line already installed or do you want the maximum presence on the road with deep-riveted pocket style flares? These are all important questions that need answering before you begin looking for flares. Once you have answers to these questions and know how much you want to spend you can begin looking in earnest without wasting time looking in the wrong places. In the following buyer’s guide, we’ll identify the main reasons for installing fender flares and show you which ones are best suited to each scenario. We won’t sort the flares by the vehicle in this guide as it deals with the reasons buyers want fender flares and the looks that they go for. Buyers that want these kinds of fender flares may simply be looking to protect their paintwork from errant rocks and road dirt. The OEM style fender flare provides a mild aesthetic upgrade and is a subtle way to customize your ride without going over the top. An added bonus of this type of fender flare is that stock wheels and tires usually look fine with them (unlike aggressive flares that demand equally wide and aggressive rubber under them to look good). People that install this kind of fender flares are usually looking to give their truck a meaner look and more street presence. Here we find the pocket style flare and its like. These type of flares turn heads and, thanks to their increased width, protect your paint better than OEM style flares while off-roading. This type of fender flare is still fairly aerodynamic on the streets while providing good coverage when things get muddy. A set of fender flares from this group will probably require some aftermarket wheels and rubber to match as stock wheels, and tires will be much too skinny and recessed to look good. So you got some new suspension, and now you need to make room for it to do its thing. Look no further! This group of flares will free up space for huge wheels, tires, and suspension travel while providing more width coverage than anything else. Funny that vehicles wearing these flares are usually built to get filthy! These flares are the most aggressive on our list and sometimes require drilling or removal of sheet metal. They’re not very aerodynamic on the street, but if you drive a Jeep with huge tires then we’re guessing fuel economy isn’t really your thing anyway. All the fender flares on this list are designed for specific vehicles but provide examples of the different styles available. The truck and off-road aftermarkets are huge, and you’ll usually be able to find the right product no matter what you drive. If you really can’t find the parts to turn your truck into a prerunner there’s always the custom fabrication. Remember: it doesn’t have to be pretty if it’s fast (or if it can go anywhere!). The difficulty of installing fender flares is highly dependent on the style of flare that you choose for your ride. The majority of the styles listed above can be installed in your driveway with a few basic tools and some care and attention but installing cut-out flares will require metal cutting and grinding wheels to produce clean lines. Cutting bits out of your truck’s bodywork is certainly not the job for a Sawzall! If you have the tools and the confidence that you won’t butcher your truck’s sheet metal, then have at it, but if you’re unsure of any part of the installation, you’d probably be better off taking your ride into a body shop or mechanic. Watch this space for a new article coming soon that’ll teach you everything you need to know about installing your own fender flares in your garage or driveway! Rust can develop under fender flares and go unnoticed because it gets covered by the flare itself. Your vehicle’s wheel arches are hot spots for rust because of the amount of water and road salt that gets thrown at them. Before installing your new fender flares, it’s a good idea to inspect for any rust that may be developing. Rust can usually be stopped with a spray-on sealant and taking care of the problem before you install your flares will save you time and money down the road.